My great great grandfather Joseph was baptised at Kenwyn in Cornwall on 30th June 1795, the son of Joseph Radcliff and Sarah . By 1841 he was living at Talskiddy, St Columb Major and was recorded as Joseph Rodliffe. He was the founding member of the Cornish family of that name. Joseph's mother was Sarah Kestle who had married Joseph Ratcliff, a soldier in the 38th Regiment of Foot, at Kenwyn on 17th September 1788 . 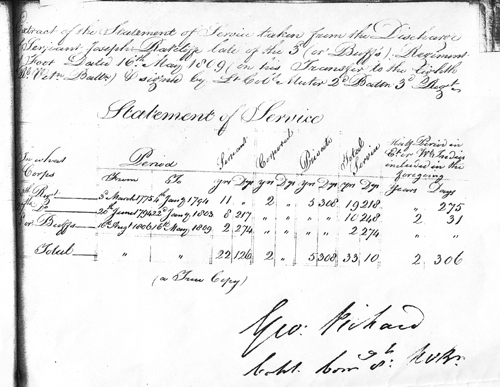 The National Archives hold a copy of Joseph Ratcliff's certificate of service (WO 121/120/108) which he would have used to prove his entitlement to a pension following discharge from the 8th Royal Veterans Battalion in May 1812 . The document paints a tantalising picture of the man and his military career. Born in the parish of Whitchurch in Shropshire, he apparently enlisted into the 38th Regiment of Foot at the age of 24 on 3rd March 1775, in time to see action at the Battle of Bunker Hill in the American War for Independence. He subsequently served in the 27th and 3rd Regiments of Foot before finally transferring to the 8th Royal Veteran Battalion. His certificate shows for each regiment when he enlisted, the time he served as private, corporal and sergeant, and how long he spent in the East or West Indies. At discharge he was considered "worn out" and unfit for service. He was described as "about 57 years of age, 5 feet 6¾ inches in height, light brown hair, grey eyes, fresh complexion, and by trade a silver plater." It seemed that he must have been remarkably lucky or resourceful or both to have survived over 30 years of service in such troubled times. As a soldier in the 38th, the odds were stacked against him surviving Bunker Hill. His later service spanned the French Revolutionary and Napoleonic Wars and seemingly included several years in the West Indies where the British army suffered crippling losses from disease - over 14,000 troops died in less than 4 years. However, the regimental musters and other documents held at the National Archives show his record in a slightly different light. Some of his certificate was accurate and some must have been the product of poor regimental record keeping augmented perhaps by stories drawn from his service in recruiting companies. The key question throughout this biography is whether the soldier whose service record is recorded in 1812 is the same who married Sarah Kestle in 1788. Apart from the lack of any other Joseph Ratcliff serving in the listed regiments around the same times, the only other evidence comes from the signatures on the marriage register in 1788 and discharge document in 1812. They look similar (see images) but are the differences explicable by the passage of 24 years? Proceed no further if you think not! These pages are my best effort at an accurate description of the life and times of Joseph Ratcliff. Footnotes elaborate the reasoning and all sources are referenced. The spelling of his surname was variable but he signed his name Ratcliff and I use that version throughout the main text. Anthony Brett-James' British Soldier in the Napoleonic Wars, 1793-1815 .